Set against the backdrop of the Hajar Mountains and nestled within a verdant oasis amongst some of Arabia’s most dramatic desert landscapes, Al Maha is a stunning Bedouin-style resort—built within its own 225km2 nature reserve. Inspired by a traditional Bedouin encampment, this secluded & internationally awarded hideaway resort blends an authentic Arabian heritage with contemporary luxury and refinement. Tented, private Arabian villas are perched on a hill overlooking soft, rolling sand dunes. Each villa comes with a private, temperature-controlled pool, handcrafted furnishings and antiques, a specious bathroom with Bvlgari amenities, and unique personal touches such as easels and binoculars. Embracing the culinary cultures of the East and West, dining at Al Maha is a truly international experience—exciting to the palate, yet remaining relatively simple and homely. Guests can dine in the acclaimed Al Diwaan Restaurant, alfresco on the veranda with breathtaking views of the reserve, or in the privacy of their own suite. Al Maha’s Timeless Spa sits amid lush gardens and the main pool area, and offers relaxing massages and other body treatments as well as a sauna, steam room, and Jacuzzi. 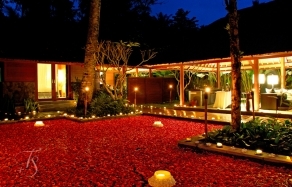 The resort offers a series of activities covering wide spectrum of interests. There is falconry, desert safaris, horse riding, wildlife drives, nature walks, camel trekking and a number of exciting off-site activities. All activities at the resort take place under the direction and supervision of an Al Maha Field Guide, who is an experienced and dedicated conservationist and has extensive knowledge of the environment, flora and fauna of the region. Al Maha, a Luxury Collection Desert Resort & Spa offers a lifestyle of luxury. Exclusive suites, each with its own pool and deck, endless sand dunes and lazing wilderness of Dubai Desert Conservation Reserve, fine food and wine, friendly personal service and romance of the desert—this is truly a place to escape. The resort lies 65 km southeast of Dubai and is approximately a one hour drive from the city and International Airport to the Al Maha Desert Resort & Spa security gate. From here, transfers are complimentary to the resort which, although only a short distance, takes a further 10 minutes due to the speed limit within the reserve.